"If you are from St. Louis or have relatives here, you know about Pork Steaks! MMMMMM. This is a family recipe that my whole family enjoys. I hope you will as well. 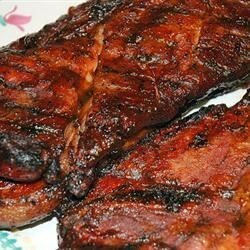 The seasoned cider vinegar leaves grilled pork steaks nice and juicy." Season the pork steaks on both sides with seasoned salt and seasoned pepper. In a large bowl, stir together the vinegar and water, and season with seasoned salt and seasoned pepper to taste. Lightly oil the grill grate. Place pork steaks on the grill. Baste steaks with the vinegar mixture on both sides during the first 15 minutes of grilling. Continue to cook steaks to desired doneness, 10 to 15 more minutes. Discard remaining vinegar mixture. Breaded ravioli are fried and served with marinara sauce. This is hardly authentic St. Louis BBQ. Carolina BBQ uses vinegar--never St. Louis. St. Louis would use beer over vinegar. It may be good, but it nees to be renamed.